The priests of this diocese have been busying themselves this past week every night hearing confessions of our laity to prepare them for Christmas. It’s an annual feature that sees scores of Catholics coming forward to dispose themselves to the sacrament of reconciliation. While it always pleases me to see a penitent leaving the confession with his or her sins behind and walking in a state of grace, I do wonder how it is that so many of them simply do not avail themselves more often to celebrate this outside of the twice yearly seasons of Lent and Advent. After all, most Catholics would know that for about 15 minutes prior to the start of each Sunday’s Mass, there would be a priest sitting in the confessional awaiting penitents who wish to encounter God’s mercy. A necessary part of the Rite always has the penitent telling us when it was that they last celebrated the sacrament. Among other things, giving us this bit of information helps us in ministering well to our penitents. It does give us an indication of their sense of sin. Some of you reading this may be wondering what is a ‘sense of sin’. When a person has a good sense of sin, he also has a conscience that is sound, alert and sensitive to the ways that God is calling him to a life of holiness and love. A dulled sense of sin, on the other hand, is one that has been insulated and desensitized to God’s prompting to lead a life that is conformed to God’s image in which each of us is made. Generally speaking, one’s sense of sin becomes lessened with the increased period of time between confessions. Availing oneself to the celebration of the sacrament of reconciliation only once or twice a year tends to see many a penitent only recalling things that had happened in the last two weeks, or at best, a month ago. 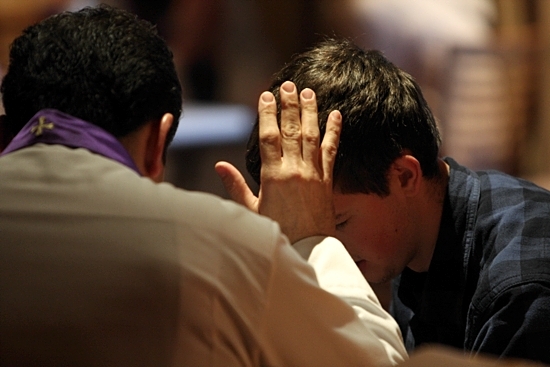 There are many human reasons for not going regularly for confession. One never is proud of one’s transgressions and because of that, one tends to put away dealing with how one has hurt another person. Besides, these times see one justifying or excusing oneself with far more latitude and license, and the ego doesn’t easily accuse itself with honesty. But it is the honesty of self-accusation that makes the confession so valuable in God’s eyes. But what is this honesty predicated on? What should it be predicated on? I loved this quotation about truth and contrition, which a directee of mine introduced me to very recently. It states that “The difference between juridical contrition and sincere contrition is this – juridical contrition is when I am sorry that I broke God’s laws, whilst sincere contrition is when I am sorry I that I broke God’s heart”. Yes, I know that it may seem a tad ‘sentimental’ for some of my readers of this weekly reflection. Yet, it undoubtedly speaks of an essential truth - that if our coming to confession is only out of a sense that we have broken a law or a rule, it may not have us realise why the commandments were given in the first place. They were given out of love. But if we understand that the laws and rules given by God were fundamentally because he loves us, our contrition and compunction that fills our hearts, drawing us to the confessional, and our raison d’etre for coming to encounter God’s mercy has a totally different predication. We come because we know that a broken heart needs mending. It may seem to be a judgment, but it really is a question – are most penitents merely contrite in a juridical sense, and that is the prime reason they only make their confession at most twice a year? I am very sure if there is a shift in their consciousness of confession being a celebration of love, that there will be a corresponding shift (akin to a paradigm shift) of God’s loving presence in their lives. It has also very much to do with honesty and truth. I recently learnt that in the world of chemistry and pharmacology, sodium thiopental is also more commonly known as the ‘truth drug’ or ‘truth serum’. Administered into the veins, it affects the brain bit by bit, and when the patient is at that ‘twilight zone’ halfway between consciousness and unconsciousness, the patient has an overwhelming urge to tell the truth. Some patients say that telling the truth with that drug in the system is quite cathartic, and that they feel so benign. One would think that this would be the perfect state to come to confession. On the contrary. If our being honest and truthful about our actions and ourselves is only because there is a part of us that has been inhibited, rendering us incapable of being dishonest, it would also render a vital part of our humanity immobilized – our freedom. God loves us too much to control our freedom to turn from him and to want to sin. But this also then makes our coming back to him so much more valuable and priceless. Especially when it is predicated on our love for him. For those of you who have yet to make your Advent reconciliation, after reading this reflection, consider making a beeline for a confessor’s time. And when you do, be embraced in God’s love once again. The house now resounds with laughter and familiar voices of family, relatives and friends as Christmas draws ever nearer. Someone inquired about Confessions & it was fortunate that there was still penitential service going on - so I obliged by dropping him off at the church where it was being celebrated. Much later, to our joy & wonder he shared openly how much lighter & at peace he felt for the insight & encouragement he experienced from this one hour encounter with Christ. What touched him and created this awareness of God's love was the preparation that the church arranged for those who went to celebrate this Sacrament! In using "encounter with Jesus " stories from the Scriptures, ( such as the Samaritan Woman at the well, Paul's journey to Damascus, Peter's encounter with Jesus & the adulterous woman ) - he learnt & was re-assured that healing and transformation, a new sense of hope & direction opens up whenever one goes in search of Him at the Confessional. ....and that God was there not to condemn & judge but it was so that he could have a better connection with God. And so one can approach to dialogue with Him without fear or guilt. All these gave him much food for reflection & helped him overcome his earlier reservations - sense of shame for his sins & feeling of unworthiness..... Later, he was blessed with a sympathetic Father-Confessor so that the night's encounter ended on a joyful note. This made him decide to be more regular in going for Confessions for he mused that - he had thought he already knew the way ....but now sadly realized he was just at a plateau and has hardly begun the longer, steeper climb of Life's journey! He would need a loving Father's hand. I thought this was beautiful. I feel a need to share - coz sometimes we may not be aware that young people are reluctant to visit the Confessional on a more regular basis because of ignorance of the beauty & graces or benefits that this Sacrament gives. We must not be too quick & impatient to dismiss their reluctance as apathy or indifference. Nobody likes to expose their dark secrets to others. It is a gift of courage from the Holy Spirit that leads us to the confession. Being given the opportunity to journey with the people who suffer terminal illness, sometimes i do hear their confessions. This includes the non catholic. I think, this comes to term of their last reflections of their journeys on earth in order to purify their souls. It is a most precious gift for themselves and also a very generous gift for the one who listen. Time to time, i will reflect it. This helps me to grow in my faith. Have a blessed coming Christmas! May our Good Lord bless you abundantly to write more reflections!